PHOEBE & DIGGER by Tricia Springstubb (Available at your local public library or bookstores, including online stores.) “When Mama got a new baby ….” things changed for Phoebe. On the good side, a new digger was her big-sister present. She loved Digger. It helped her ignore all the loud and annoying baby-stuff going on. It filled the gap of missing Mama’s time with her – just her. When Mama decided to go to the park, Phoebe was excited about taking Digger. The park had “real dirt.” Phoebe and Digger had a great time playing – until a “crybaby boy” made it seem that Phoebe wasn’t being nice. “Phoebe, can’t you just play nicely?” was Mama’s reaction. Phoebe ended up in a time-out with Mama telling her, “ … she could go play, if she knew how to be nice.” Phoebe decided she could play nicely, but then came a Digger attack. A “giant” bully girl arrived and helped herself to Digger. When neither being nice nor being naughty was successful at rescuing Digger, Phoebe was about to be just like the baby and let out an “…I’m-all-alone WAA.” But, her Mama was quick to step in and help. Being protected by Mama left Phoebe feeling totally “Safe!” – and for the first time she acted like a caring big sister. Dr. Mom: If you are expecting a new baby at your house, you probably have imagined that brothers and sisters at home will have mixed feelings – a little happy, a little mad, and a little sad too. Darling Daughter: And jealous … and competitive … and abandoned … and bitter … and left out … and contempt … and crummy … and perturbed … and uncertain … and irritated. Dr. Mom: Well, you are what Jim Collins (GOOD TO GREAT) calls “brutally honest.” It takes that to become a great parent just like it does to become a great business leader. When dealing with the emotions you have listed, keep your tank full (see below) and be sure to protect your child from hurting himself or the baby (Watch for the parenting tips on this in May.) as he deals with these emotions. But, have you also considered that they might be scared as well? In PHOEBE & DIGGER, Phoebe was very scared she was going to lose her digger. But, I suspect that this fear was more deeply felt because she was generally scared about what was happening to her. She was becoming a sister with all the changes that meant – changes in her relationship with Mama, in how the house sounded and smelled, and what was expected of her (for example, to be more grown-up). Was this new baby going to mean she wasn’t as important to her mom anymore? Could she still get her needs met now that the baby was so needy and Mama was so busy all the time? Nothing is more scary to a child than that. So, when new babies are coming or have arrived, it’s a good idea to think about how you can reassure older brothers and sisters that they are still important and that you are going to be there for them – as Phoebe’s mom was when the bully girl arrived in the park and took Digger. 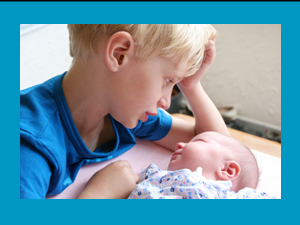 For more thoughts on how to handle a new baby’s arrival with older children check out Kids and Sharing, part 2. When a new baby arrives or anything new is going on in a household (illness, a move, divorce, lots of company, holidays, etc. ), we tend to give a lot of do-it-this-way messages to children. This is the way we try to stay in control and prepare for the chaos of the unknown. We warn the kids what to expect. We tell them the rules. We watch what everyone is “doing” to make sure they are doing what they are supposed to when they are supposed to. These types of messages are necessary, but they need to be balanced with messages that are just about loving who the children are and enjoying them. You will be surprised how much better they will be with the directions and rules if they are also hearing how great they are as people. Darling Daughter: I find that Ezzy also responds well when I tell her what I need instead of telling her what she needs to do. Sometimes I just tell her a general “I need you to be cooperative and helpful” instead of “You need to do as you are told.” Most times I leave it open-ended and let her figure out how she is going to make it happen, but other times (if she is really struggling with complying) I will help her brainstorm some ideas on how to meet my expectations. I will ask if she can do what I’m asking, and I will ask her what she can do to make it happen. When my children were small and things seemed to be going downhill at our house – unhappy, squabbling, unproductive kids and adults, I spent some days actually tracking my words and actions. How many were in the category of “love you; you’re great” (patting, hugging, etc.) and how many were in the category of teaching skills, setting rules, enforcing rules, praising accomplishments, etc.? I usually found the two lists to be quite out-of-balance – sometimes in one direction. Sometimes in the other. It didn’t matter in which direction they were out of balance. The result was the same — chaos. My tactic after seeing my list was to beef up the weak side of the teeter-totter (And Calm Fell Over the Household) with more messages and actions in that category. More often than not, things evened out and calm fell over the household. 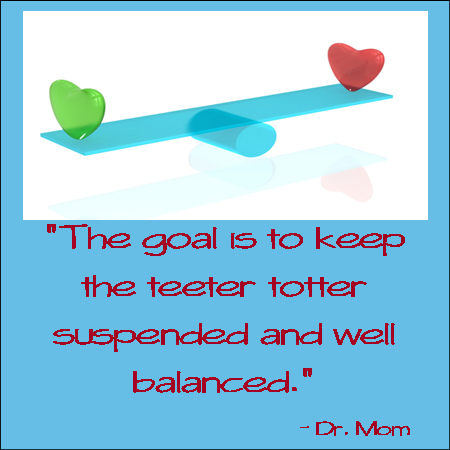 For more thoughts on balanced messages check out Love Your Kids No Matter What, Part 1 and Love Your Kids No Matter What, Part 2. It means we feel sure of our power over the dog even when we don’t feel able to handle our other frustrations. So, when something bad happens to us and we feel powerless to make things right, we act out our frustrations by kicking the dog. What do we do when good things happen to us? We take good care of ourselves and take better care of others. When we are well taken care of ourselves, we have plenty of energy and are better able to be kind, loving, and helpful to others. Soooo true but sooooo hard to do! Make sure you have people around you who will take care of you when you need extra love and attention. Keep your tank full. Just like with gas in the car, you need to go get it. It doesn’t magically appear when the tank is low. You mean there is no gasoline fairy like the tooth fairy? Keeping the tank full (personally and in the car) is a tough task. We all would wish for a magical solution. 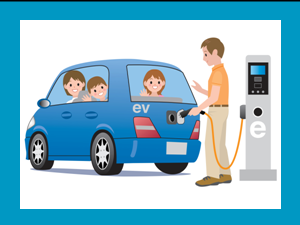 Carrying the car comparison further, the electric car is a breakthrough. It’s much easier to fill the tank – at home – with no standing outside in the weather and free time to do other things while getting re-energized. We need a breakthrough like that for our own tanks. Right now we wait for someone else to notice we are empty and give us what we need. It would be better if we found ways to be more independent and responsible for ourselves – like an electric car. Something to think about. On May 1, we will continue with more thoughts inspired by PHOEBE & DIGGER: adults stepping into children’s battles, being nice, tattling, and boy toys versus girl toys. See today’s “Daily Parenting Tip” based on our featured book. Come back each day for another good parenting decision and how to practice it.